Gardening in Spain Garden sage, Common sage. Sage has been valued over the centuries by many cultures and has a long history of medicinal and culinary use, and in modern times as an ornamental garden plant. 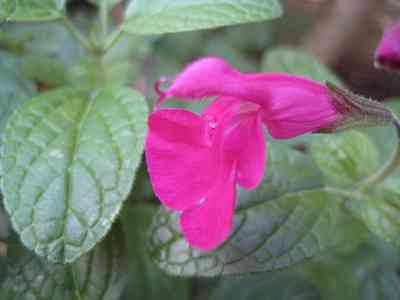 The names Salvia and “Sage” are derived from the Latin salvere (“to save”), referring to the healing properties long attributed to the various Salvia species. 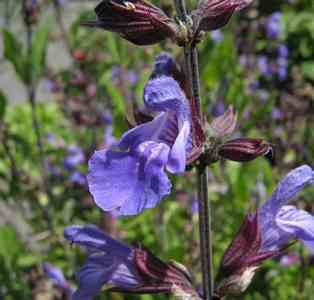 Salvia officinalis (Garden sage, Common sage) is a small perennial evergreen subshrub with woody stems, grayish leaves, and blue to purplish flowers. It is native to the Mediterranean region, though it has naturalized in many places throughout the world. 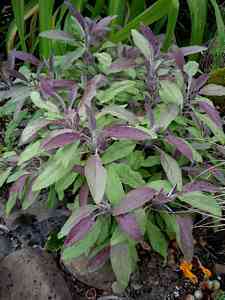 Salvia officinalis is the ordinary garden sage best suited for cooking. There are other varieties that are pretty. Cherry sage has red tips. Golden sage is all golden. Both of these make nice garnishes, but do not have as intense a flavour as garden sage. Cultivars are quite variable in size, leaf and flower colour, and foliage pattern, with many variegated leaf types. The most common colour of the flowers is lavender, though they can also be white, pink, or purple. The plant flowers in late spring or summer. 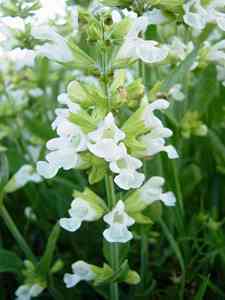 To grow sage, you have several options. Seeds will grow if placed on a pre-moistened flat of soil and covered by 1/4 to 1/2 inch of soil. Cover the flat with plastic and place in a dark, warm place. The soil needs to be around 70°F (21°C) for germination to occur. In 7 to 21 days, the seeds will germinate. You will have to check on them often as the plants will need to be transplanted when they have two sets of true leaves. Put them in individual pots and place the flat back into the dark to see if other seeds will germinate. If you have a friend that has some sage, you can get a cutting and start that. Dip the end in rooting hormone and plant it. Give the plant a few weeks to establish roots and there you go. Some of the more colourful sages can only be propagated from cuttings. Finally, you can buy plants from most nurseries. Seeing, smelling, and tasting the plants are important because each variety has many variations itself, so you want to make sure you get what you mean to purchase. You can transplant the plant easily into your prepared bed when you get home. In any case, do not plant sage outside until all danger of frost has passed. The coloured sages, especially, will not tolerate frost. 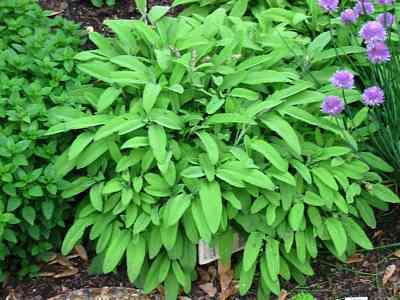 Garden sage is more hardy, but only as a mature plant. It can grow into a 36 inch by 36 inch plant, so make sure you put it where there is plenty of room. Otherwise, you will have to prune it to make it fit the space you have. Never prune more than a third of the plant at a time, however. It takes sage three years to reach its full size. However, failing to plan can lead to overcrowding. This leaves the plants vulnerable to fungal diseases and insect pests. It does not like excessive soil moisture or humid air. Care should be taken to keep it moist, but a little drier than most plants. If you live in a very humid climate, growing indoors may be the only way you can grow it. Plants may be harvested as early as their first year, but it is better to let them concentrate on growth first and wait until the second year to start taking cuttings. Cut the sprigs for use fresh or dried. Remember to cut no more than one third of the plant at a time. Your plant will put on fresh growth and be ready to harvest in two or three weeks. Growing two or three plants and harvesting one each week is one way to ensure continuous availability of the herb. Sage can be chopped up, placed in an ice cube holder, then covered with a little water, and frozen. The cubes can then be placed in a plastic bag for convenient use in recipes. Freeze one tablespoon per cube, and simply take as many out as you need that day. 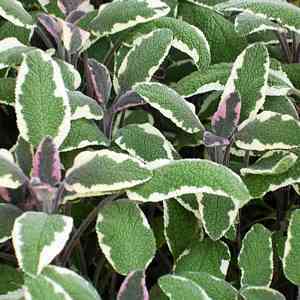 Sage-Plant Hardy evergreen perennial with green leaves. Will grow to a height of approx 60-80cm. Water well before planting. Can be planted all year round..
Leaves are used to make tea, and used for flavouring meat. Traditionally used for stuffing goose and pork. As with all of out plants these plants are grown in at our nursery that has been growing top quality plants for over 60 years. Spain Info sage, San Francisco De Asis, Urb Marina, San Fulgencio, 03177, Alicante, Spain. 38n21, 0w29.